To make this year’s Christmas more enduring Swiss Post organised a special survey in November 2017. In this, they ask people what kind of image they would like to see on the 2018’s Christmas stamps. The winning design was a photograph, Martin Magli provided three additional motifs afterwards. This all photo depicted beautiful snow-clad buildings in winter, photographed in the blue hour shortly before nightfall. The first stamp depicted Bottmigen Water Castle that is situated in the canton of Basel- Land. The second stamp depicts majestic Kandersteg Church that is located at the bottom of Kander valley. 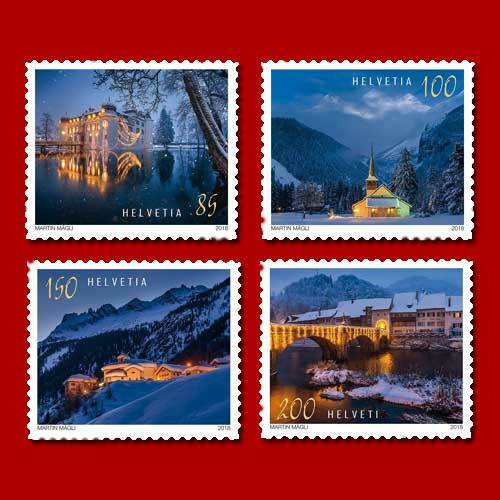 Bedretto Village located in the foot of the Nufenen Pass is illustrated on the third stamp. The fourth stamp featured Saint-Ursanne Bridge.